After completely drying down your property, Incredible Restorations brings your property back to its pre-water-loss condition. We can provide the service you need to restore the building, including all aspects of reconstruction such as: insulation, drywall, carpentry, painting and decoration. 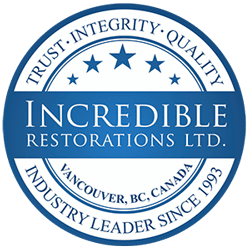 Over the last 20 years, Incredible is recognized as a premium restoration company, hiring the best construction professionals in the lower mainland. Our standards for professionalism and customer service are quite high, we expect our drywall contractors and in-house staff to service our clients with care, a solutions-oriented energy, and professionalism. Our drywall installers setup proper site protection to assure a safe and clean reconstruction site. Our drywall installers understand that this is your home, and all your possessions are very meaningful to your and your family, so we inspire our staff to treat any one of Incredible’s client homes as if it was one of their own. Working with Incredible Restoration in your rebuilding your property, is working with construction professionals that truly care. As part of the emergency and demolition process, we cut our water damaged drywall 24 inches up with Kett Vacuum Saws for fast cutting controlling dust flying all over the place. Incredible Restorations is a premium provider in home and residential property restorations. We are committed to excellence in rebuilding your property that suffered water or fire damage mitigation. We specialize in all areas of property reconstruction; From large scale multi-unit interior reconstruction and smaller repair projects. Our carpentry experts can assist you in providing effective and rapid solutions to restoring residential and commercial properties. frame interior walls, install drywall, crown molding, doors, and cabinets. tile floors and lay wood floors and carpet. Your property is important to you, and our in-house repair team and contractors understand this. We uphold the highest standards in restoration quality, professionalism, and care. Our operations team are highly experienced individuals. We enjoy being friendly and providing effective communication focused on results. Incredible Restorations offers you peace of mind during your home renovation.